Peggy Collins Photography: Happy Canada Day! I want to wish my fellow Canadians a Happy Canada Day! The weather here is gorgeous and I hope the sun is shining for you wherever you are. 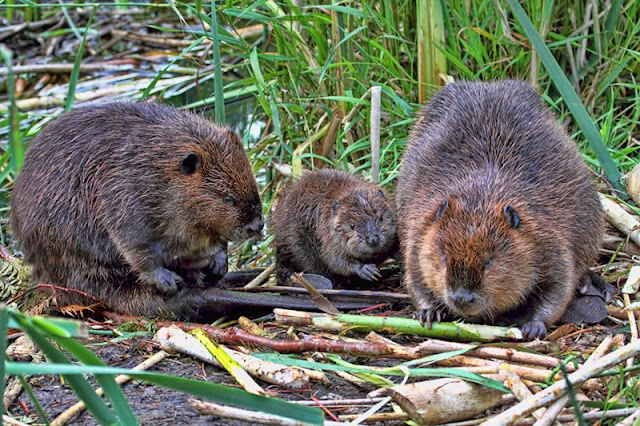 I thought this photograph of a beaver family was an appropriate shot to post today since the beaver is Canada's national animal. I photographed the happy family pictured above behind our local post office where there's a marsh with a boardwalk over it. There was a small island right next to the boardwalk and the beavers weren't too shy about settling in there for a fine meal of bullrush stalks. Judging by her size, the beaver on the left is mama, and she's busy grooming...beavers are constantly spreading the oil from their glands over their fur, especially after they've been in the water. Big Daddy (on the right) is chowing down and baby beaver is looking on, begging for food by the looks of him. The first time I heard a baby beaver was a startling experience. Did you know that they cry just like a human baby? This family had two babies and one of them was constantly crying and couldn't seem to bare being alone for a moment. The other baby had a very different personality and was quite independent. I've noticed how animals seem to develop their own personality right from the get-go and that's how you can tell them apart. Anyway, enjoy your special day celebrating our amazing country, my fellow Canucks!